The Golden Teapot at Faller is a unique example of a nineteenth-century trade sign. Long before trades had large shop windows to display goods and when reading and writing were still a rarity, signs were hung outside shops and businesses to draw attention to their goods and services. These were carved or constructed, mainly in wood or metal and then painted or gilded. By the early eighteenth century they were commonplace. As trade flourished with more competing businesses in the same area, signs became ever more elaborate and prolific. In 1762 the first law was passed in England to regulate street signs and many were banished. 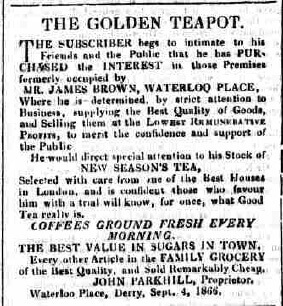 The golden tea-pot was still a common sign over a grocer’s shop in the early nineteenth century. As this excerpt from a poem lamenting the images on stamps when they first appeared suggests. Woolmer’s Exeter and Plymonth Gazette, 16th May 1840. 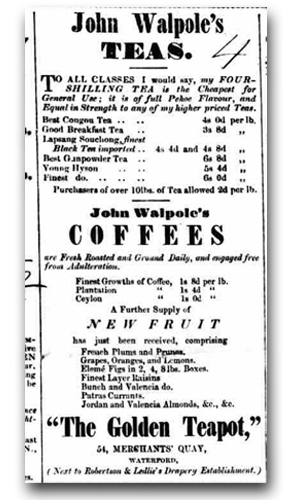 It will come as no surprise some firms began to use the sign itself in the name of their businesses as these newspaper advertisments from 1829 to 1886 show. 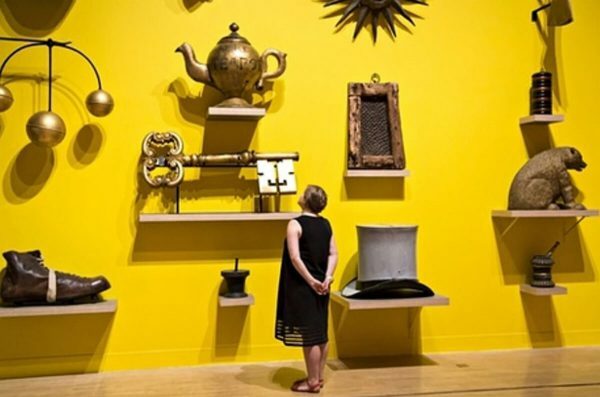 England, Ireland and Scotland all had businesses presented by a Golden Teapot. One of these may have inspired Mr. Parkhill to commission the trade sign which made his premises stand out from his competitors. By the late nineteenth century with the increase in education and literacy, written signs became standard. 3d trade signs became rare and only particularly fine examples remained. Fires, the closure of businesses, rezoning and redevelopment of towns and changing town planning regulations all contributed to the demise of many interesting trade signs. OTHER TEA SIGNS THAT STILL EXIST…. The gilded wooden teapot pictured here is the only other example of a gold teapot sign still in existence. It was a grocer’s sign once displayed by Robert H. Fox and later John Dodson at his shop at the corner of Magdalen St and St Saviour’s Lane, Norwich and usually resides in the Strangers Hall Museum, Norwich. It is around the same age as Derry’s golden teapot but much smaller. The only trade sign that can really compare to the Golden Teapot and is still on display at Court & Tremont Streets (Government Center) is Boston’s “Giant Tea Kettle”. Like Derry’s Teapot, it was also designed to produce steam. The old Oriental Tea Company sign was manufactured in 1873 by a company called Hicks & Badger, commemorating 100 years since the “Boston Tea Party” during the American War of Independence. 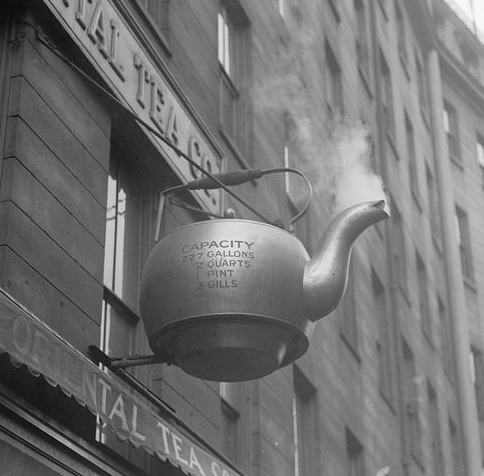 On January 1st 1875 a contest was held to guess the Tea Kettle’s capacity. More than 10,000 spectators filled the square that day and the Tea Kettle became a famous tourist attraction for many years. 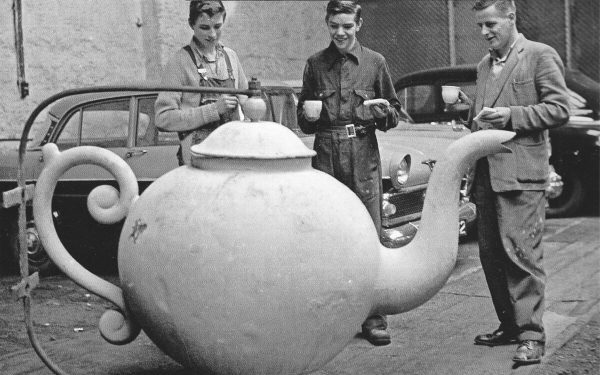 Bostonians say their “Tea Kettle” is the largest in the world. It is similar in size to Derry’s Teapot. During the early nineteenth century, Derry moved up from being the twelfth largest town in Ireland to being the fourth. People moved into the town after the terrible famine in the countryside as the shirt factories were providing a degree of prosperity. The city’s population quadrupled and the town rapidly expanded to deal with the influx. 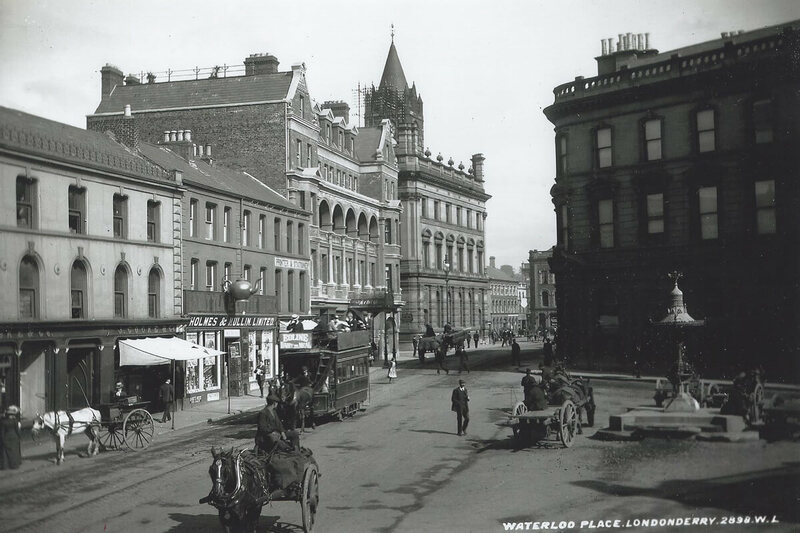 At the beginning of the nineteenth century, Waterloo Place, named after the Battle of Waterloo in 1812, was mostly slob land which had to be reclaimed from the mud flats along the Foyle. By the mid-century, this area had developed into a prosperous part of the city. The Golden Teapot first appeared in September 1866. 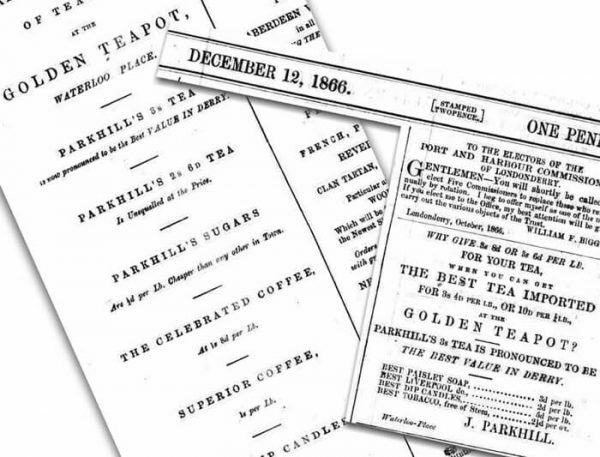 At that time, notices in the Londonderry Sentinel, Londonderry Standard and Fermanagh Mail headed, “THE GOLDEN TEAPOT,” advertised John Parkhill’s new grocery business in Waterloo Place. John Parkhill took over premises from Mr James Brown. The Teapot was made from copper sheet segments lead soldered together and is likely to have been made by tinsmiths. While there where several firms in the city capable of making it but there are no records of its construction surviving today. Parkhill’s was taken over in 1885 by Holmes and Mullin who called their business “The Golden Teapot Warehouse.” and the firm prospered. The Golden Teapot hanging in Waterloo. In the background the Guildhall is being re-built after a fire in January 1908. [Photo courtesy of the National Library of Ireland]. 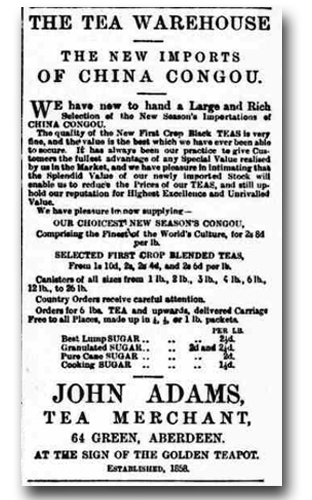 In 1912 the company sold the Waterloo Place retail premises on to Mr William J. McCullagh. Mr McCullagh had been one of their employees for the previous 11 years. 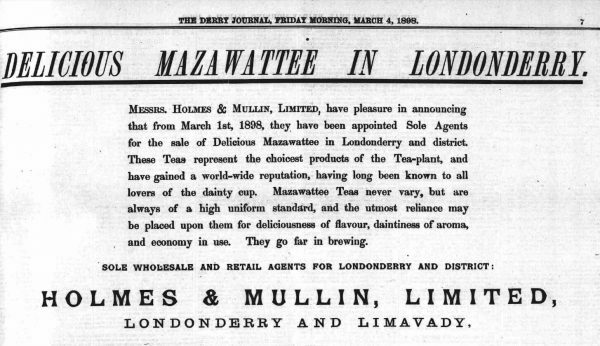 Originally from Donemana, William McCullagh came to Derry as an apprentice to the grocery trade in 1884. He had gained extensive experience as a traveller for Maxwell, Greer & Co and then for Holmes & Mullin. His attention to detail, progressive attitude and courtesy gained him wide support and the grocery and provisions store was greatly developed under his leadership. The Golden Teapot hanging outside McCullagh’s shop in Waterloo Place around 1934. [Photo courtesy of the Bigger and McDonald Collection]. Mr W.J. McCullagh’s sons Harold and Norman succeeded him after his untimely death from a heart attack on 12th January 1928 aged about 50. At various times in the past, there was a facility for steam to emerge from the pot’s spout. It was originally generated by a small boiler inside the building that passed the steam out through an internal copper pipe. By the 1930s, however, this had ceased to function. 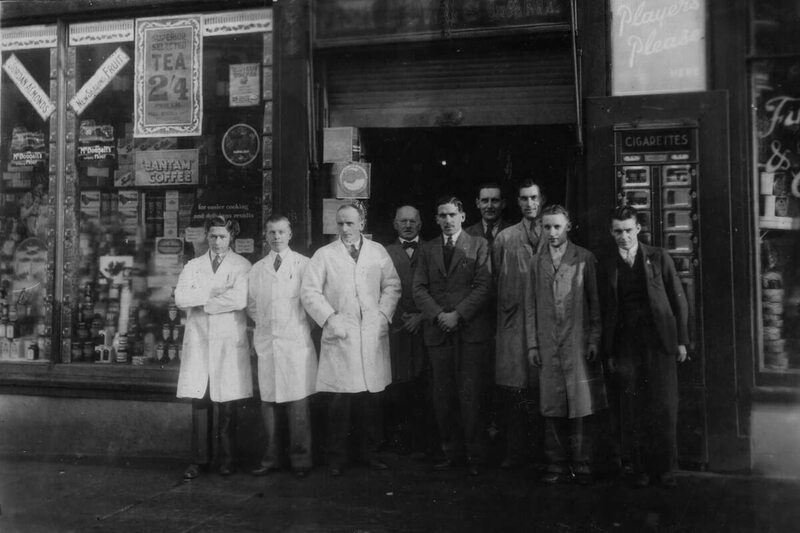 The staff in the photo are Robert S. Neely assistant, Robert Kenwell assistant, Jack Dunlop provisions manager, Harold McCullagh proprietor, David Riddles storeman, George Hudson assistant, Eddie Devine fowl butcher, (last 2 unknown). 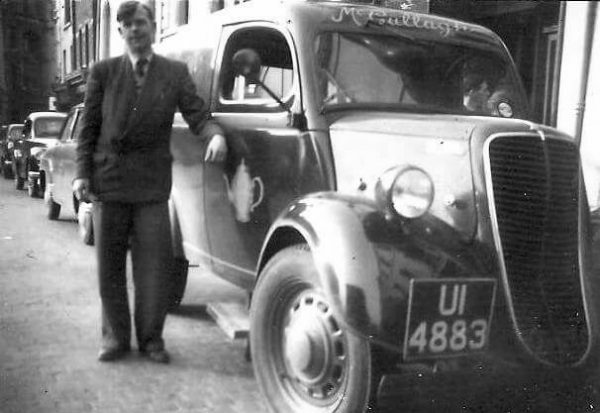 Robert Neely started work in McCullaghs on 9th January 1934 as an assistant in the provisions department, (apprenticed to the grocery trade). He left in 1947. Further expansion came for the family business in 1938 when a 2nd branch was opened in 55 Clooney Terrace. About Lord Haw Haw. . . In the heightened atmosphere of 1940, with the U.K. facing sustained bombing, a wave of “Haw-Haw rumours,” swept the country. One of these was that Joyce referred to British forces, “hiding behind,” the golden teapot, when naval ships were lined along the nearby docks. Although in reality, very few of these rumours were correct; this one took hold and has gone down in popular folklore. Martin Doherty, a lecturer in history at the University of Westminster explained the reality. “….there occurred a wave of rumours which would begin, “Lord Haw-Haw said…” Normally the rumours took the form of a story that Haw-Haw had referred to some particular town or village and, by mentioning an item of purely local interest, revealed his detailed knowledge of British life and geography – a town hall clock five minutes slow at Eastbourne, a card school in a munitions factory disrupted by a German raid, a reference to the Golden Teapot (an advertising sign) in Londonderry… Of course, as the Ministry of Information was forced to repeat time and again, rarely if ever did the Haw-Haw broadcasts include threats to specific towns or cities and certainly they never included references to named factories or installations, or teapots or town hall clocks. In 1963 the Teapot was taken down for the first time in almost a century when McCullagh’s shop at Waterloo Place was demolished to make way for the building of the new Savings Bank. It was taken to Mc Cullagh’s garage in Clooney Terrace in the Waterside. There it underwent an overhaul before being reinstated above McCullagh’s other branch at 55 Clooney Terrace. 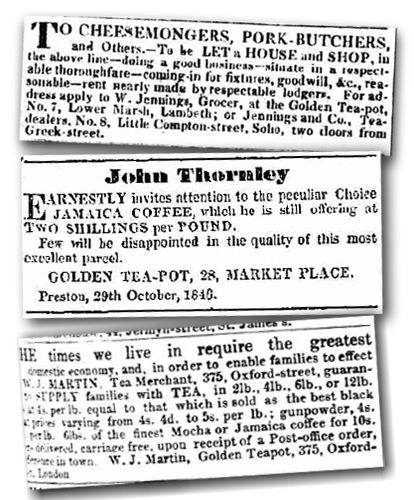 Displayed in Waterloo Place for nearly a century the Teapot barely lasted a decade in Clooney Terrace. 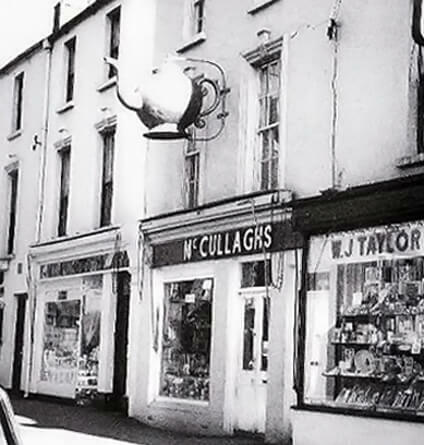 In the early 1970s when McCullagh’s grocers closed after Norman McCullagh’s death the Teapot was taken down and stored away. 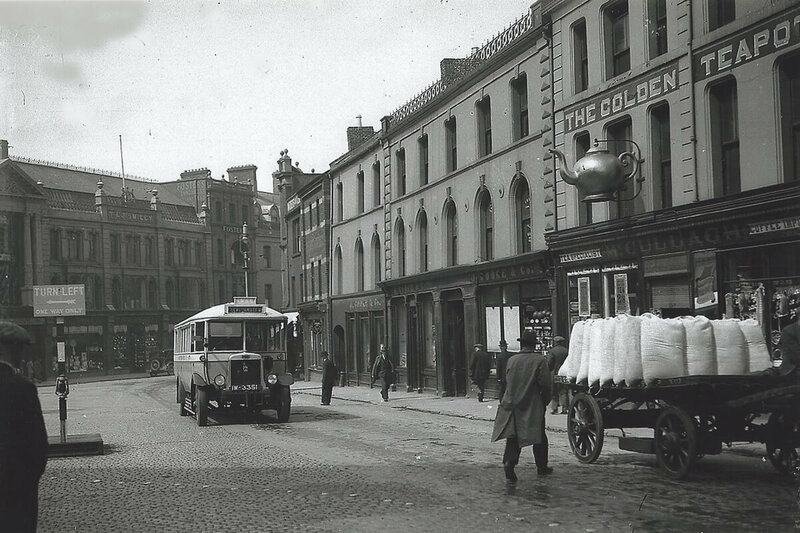 Gone from public view, the Golden Teapot became just a memory for most of the Derry people. Noel Faller bought it from Mrs Jean McCullagh in 1974. The teapot was kept safely in storage through the turbulent era of the troubles. For those that remember when the Golden Teapot was last on display….. In August of 1990, in an effort to improve the community’s civic awareness and appreciation, the Foyle Civic Trust held a Shop Front Competition. The general public nominated their favourite shops, 261 in total. From these, the judges selected the Acorn, the Linenhall and the Sentinel as the winners, with each owner receiving a prize of £250. St. Columb’s College and Steelstown Primary school received special prizes in recognition for the quality of artwork in their nominations. An exhibition of old shop signs and advertising material was held in the Central library in December for the presentation of prizes by the minister, Mr Needham. The star of the display was the Golden teapot, lent by Noel Faller. The mayor and John Hume were among the dignitaries present. The exhibition continued in the central Library for almost 3 weeks and then moved to the Waterside library for a further 3 weeks. Pictured from left. Mr Joe Tracey, Chairman of the Foyle Civic Trust, Northern Ireland minister of the Economy, Mr Richard Needham, Foyle MP, Mr John Hume and the Mayor of Derry, Colr. David Davis. 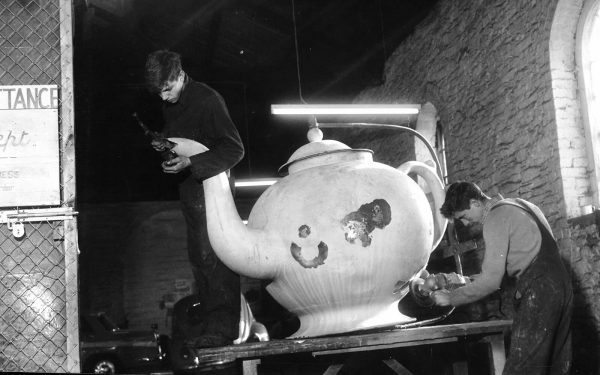 Fallers began restoration work on the teapot in the 1990s. David Thomas, a highly skilled silversmith who had previously worked in the firm’s jewellery workshop carried out the restoration. He carefully removed the dents, repaired holes, replaced the iron base with copper and strengthened the teapot on the inside with fibreglass matting. Finally, he applied fine gold leaf to the entire exterior. At that time a replica iron wall bracket was made in a local engineering works but in 2000 it was decided to re-design the fixing to meet today’s safety standards. Local engineer Edward Meenan designed and built a new bracket in stainless steel box section. It was coated in black powder for long term ascetics and to prevent water staining on the teapot. It will also allow the teapot to be easily removed for cleaning and re-gilding every five years or so. Fallers hoped to restore it using a steam boiler as used in Derry’s shirt factories to iron shirts. This plan proved problematic, however, as it meant having a boiler in one of the firm’s workshops and that raised health and safety issues. It was also going to be difficult to regulate steam pressure. Too much steam emerging from the spout would make the teapot look more like a kettle. Edward Meenan undertook much research to solve this problem. The decision was made to install a smoke generating machine which produces a plume of white, water-based environmentally friendly ‘steam’. It dissipates within 20 seconds but has the advantage of being visible even on sunny days. This machine can control the function to allow the ‘steam’ to be emitted on the hour every hour. As the firm no longer sells clocks or watches, this prompted Noel Faller to quip, “Although we don’t sell time, we will still tell the time”. Just prior to erection the teapot was again partly re-gilded with gold leaf by Moville sign writer, Kieron McLaughlin. The Golden Teapot was installed on the façade of Faller the Jeweller at 12 Strand Road early in the morning of the 20th of January 2013 by Edward Meenan and his team. This marked the 130th year since the first Faller shop was opened in Derry city by William Faller, a 23-year-old German immigrant. The firm’s present owner is his grandson Noel. The teapot itself weighs 74kg and the wall bracket 19kg; the teapot is 1940mm from handle to spout and has a diameter of 1100mm. Derry folk can be proud that their magnificent Victorian trade-sign is back on display again. The Golden Teapot previously hung in the city for over 100 years. It has had an eventful history and the fact that it has survived so long is remarkable. With the steam spouting from the teapot on the hour every daylight hour, it is hoped the teapot will capture the imagination of all who see it. As a major landmark in the city it is likely to become a popular meeting point again.